PALM BEACH, Fla. — Mitt Romney went well beyond his standard stump speech at a closed-door fundraiser on Sunday evening, and offered some of the most specific details to date about the policies he would pursue if elected. GOP presidential hopeful Mitt Romney floated the idea of eliminating the Department of Housing and Urban Development, the cabinet-level agency once led by the candidate's father. In a speech to donors in the backyard of a private home here, the former Massachusetts governor and presumptive GOP presidential nominee outlined his plans to potentially eliminate or consolidate federal agencies, win back Latino voters and reform the nation's tax code. And even Ann Romney, the subject of a national debate last week over the role of women in the workplace, was more direct than usual. She sounded like a political tactician when she described a Democratic consultant's criticism of her decision to be a stay-at-home mom as "an early birthday gift." Romney went into a level of detail not usually seen by the public in the speech, which was overheard by reporters on a sidewalk below. One possibility floated by Romney included the elimination of the Department of Housing and Urban Development, the Cabinet-level agency once led by Romney's father, George. "I'm going to take a lot of departments in Washington, and agencies, and combine them. 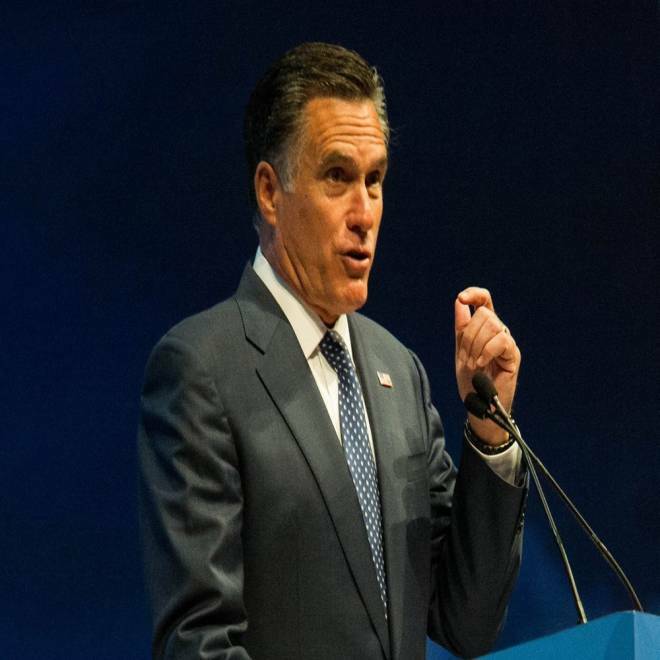 Some eliminate, but I'm probably not going to lay out just exactly which ones are going to go," Romney said. "Things like Housing and Urban Development, which my dad was head of, that might not be around later. But I'm not going to actually go through these one by one. What I can tell you is, we've got far too many bureaucrats. I will send a lot of what happens in Washington back to the states." Asked about the fate of the Department of Education in a potential Romney administration, the former governor suggested it would also face a dramatic restructuring. "The Department of Education: I will either consolidate with another agency, or perhaps make it a heck of a lot smaller. I'm not going to get rid of it entirely," Romney said, explaining that part of his reasoning behind preserving the agency was to maintain a federal role in pushing back against teachers' unions. Romney added that he learned in his 1994 campaign for Senate that proposing to eliminate the agency was politically volatile. At that time, Sen. Ted Kennedy ran ads against Romney — then a political neophyte — accusing him of being uncaring for saying he wished to eliminate the agency. Romney told the audience here tonight (along with the Weekly Standard in an interview in early April) that that experience remains fresh in his mind. It's contributed to his caution in publicly naming federal agencies and programs he would eliminate or dramatically curtail. Romney's wife Ann also spoke briefly, where she described her role in a controversy over women in the workplace and Republicans' efforts to make inroads with female voters. Mrs. Romney acknowledged Republicans' deficit at present with female voters, and urged the women in attendance to talk to their friends, particularly about the economy. She also discussed the criticism she faced this week, and her pride in her role as a mother. "It was my early birthday present for someone to be critical of me as a mother, and that was really a defining moment, and I loved it," Mrs. Romney said. Gov. Romney went further in engaging the so-called "war on moms" that followed in the media — upon which his campaign has been aggressively fundraising — calling it a "gift" that allowed his campaign to show contrast with Democrats in the general election's first week. Romney also went into greater detail than he has on the campaign trail in describing how he would maintain the progressive structure in the tax code after implementing his 20 percent across-the-board tax cut. Democrats have argued that Romney's tax proposals would disproportionately help the wealthy, but on Sunday, Romney identified specific loopholes and deductions for the wealthy that he would eliminate in order to both finance his tax cut, and ensure that the nation's top earners face the same tax burden they do today. "I'm going to probably eliminate for high income people the second home mortgage deduction," Romney said, adding that he would also likely eliminate deductions for state income and property taxes as well. "By virtue of doing that, we'll get the same tax revenue, but we'll have lower rates," Romney explained. "The nice thing about lower rates is that small businesses not get to keep a larger share of what they're earning and plow it back in to hire more people and expand their business." Romney covered much of the ground he does in his standard stump speech before a crowd of several dozen donors, who were gathered to contribute to his new general election "Victory Fund." But Romney also offered, over fried chicken and snapper, a simpler way of understanding his economic policies. "I'm asked — how do you boil it down, how do you encapsulate this into a campaign message: Two things, jobs and kids," Romney said, explaining that restarting job growth and preserving a better future for the next generation were the campaign's guiding principles. Though the general election campaign has only begun in earnest — and the policy proposals floated by Romney on Sunday evening were far from formal platform items — the former governor's remarks marked the campaign's acute sense of what awaits them in the coming months. That sense was represented in Ann and Mitt Romney's discussion of how they might win back women. The former governor also addressed how he might make strides toward winning back Hispanic voters, another crucial voting bloc with whom he and other Republicans lag, according to recent polls. Predicting that immigration would become a much larger issue in the fall campaign, Romney told his audience, "We have to get Hispanic voters to vote for our party," warning that recent polling showing Hispanics breaking in huge percentages for President Obama "spells doom for us." Romney said the GOP must offer its own policies to woo Hispanics, including a "Republican DREAM Act," referring to the legislative proposal favored by Democrats that would offer illegal immigrants a limited path to citizenship, to give Hispanic voters a real choice between parties. Romney also described his media strategy going forward, including his views on so-called "earned media," and how the campaign might pair surrogates with complimentary news outlets. He said his campaign had been well-covered by Fox News, but that Fox was watched by "the true believers," and that he knew he would have to reach out to a broader audience in order to win over independents and women voters that will decide the election in November. He painted a picture of a media landscape in which liberal voices won out on television, but conservatives were strongest online. "We are behind when it comes to commentators on TV. They tend to be liberal," Romney said. "Where we are ahead or even is on twitter and on the Internet."